Say you’re traveling in a strange new city but suddenly find yourself really jonesing for the familiar comfort of pour-over coffee and man buns. 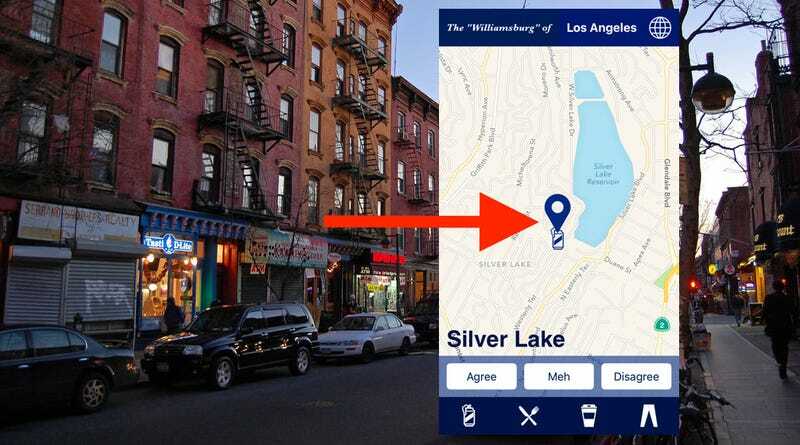 A new app will help you find such amenities in any city you visit, or, more helpfully, allow you to steer clear of them. Ray used some highly scientific datasets to find the most Williamsburgian neighborhoods: The density of American Apparel stores, advice from her hipster friends, and this Gawker story. But fear not! If you disagree with where the Williamsburg is located in your city, the app does take user input into account. “So yes, if enough people selected a different neighborhood it would change the pin,” Ray said. Also, if your city is not “on the map,” as they say, you will be able to add your pick for the Williamsburg of your town. Also it’s important to know that according to the app, the Williamsburg of New York City is... Bushwick.